A new method for left-leaning decreases: SYTK (slip, yank, twist, knit)--part 3 of the series "right and left decreases"
it requires no re-ordering of stitches (the stitches are never taken off the needles and reversed in position--a procedure which, although it leads to good results, I find annoying and time consuming). Below are the how-to illustrations. Do not be discouraged that there seem to be so many steps--the whole business takes only a few seconds. The point of having so many illustrations is to leave no doubt about how to do a SYTK--every little part has its own picture, and that'll avoid confusion, I believe. At the end is a photo comparing SYTK with k2tog. The post finishes with a tip on perfecting the SYTK in grabby wool. Step 1 (below) Slip the first (red) stitch from the left needle to the right needle. Slip the stitch KNITWISE (left arm forward) as shown. 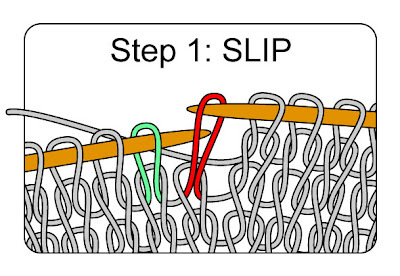 This is the SLIP part of the SYTK maneuver--the part represented by the first letter "S."
Step 2 (below) Leaving the red stitch on the right needle, insert the tip of the right needle into the next stitch (green) on the left needle. Be sure the tip of the right needle is inserted under the right arm of the green stitch, as shown. 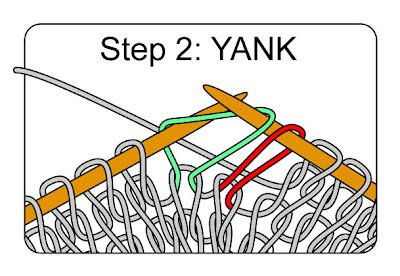 Now comes the fun part: making sure that you have enough of each needle inserted to anchor the stitch completely, perform the "Y" part of the SYTK--the YANK! Pull the right arm of the green stitch towards you with the right needle at the same time as you pull the left arm of the green stitch away from you with the left needle, thus opening up the stitch as much as possible. You don't want to bend your needle or stretch the actual fibers of the stitch, but you certainly want to YANK enough to pull all the slack yarn from both surrounding stitches into the green stitch. 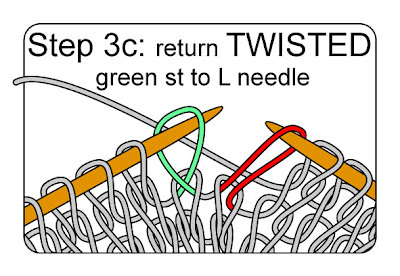 Step 3a (below) Begin the TWIST ("T") part of the SYTK decrease by removing the right needle tip, thus returning the now-enlarged green stitch to the tip of the left needle. 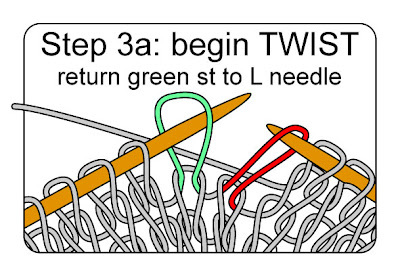 Step 3b (below) Using the tip of the right needle, TWIST the green stitch, and return it to the tip of the left needle, as shown. Check to be sure that the formerly right arm lies ON TOP, as illustrated by the little PURPLE ARROW. 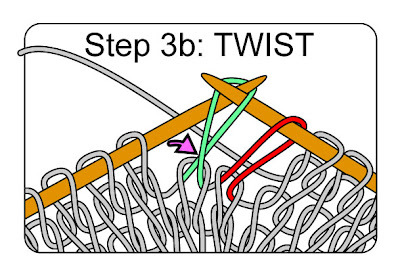 If the stitch is twisted the wrong way, take it off and re-twist it so that it lays as shown--this is fairly important to the final appearance. Step 3c (below) Return the much-enlarged, now-twisted green stitch to the tip of the left needle. Step 3d (below) Slip the red stitch onto the tip of the left needle, taking care that it remains LEFT ARM FORWARD. 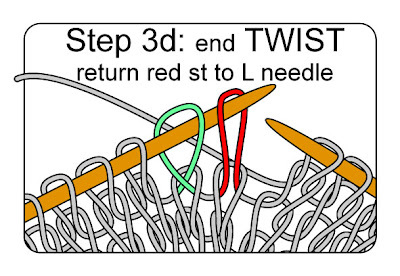 This ends the "Twist" portion of SYTK, the "T."
Step 4 (below) Insert the right needle into the BACK ARMS of the red and green stitches, as shown, and twitch the standing yarn over the right needle, in position to knit a stitch. FINISHED SYTK (below) Draw the standing yarn through the red and the green stitches to make a new stitch (blue). 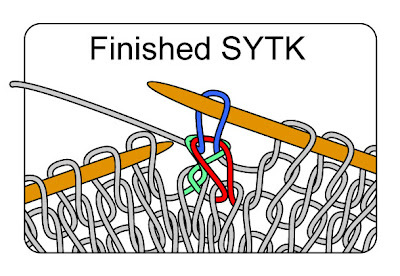 This is the final, the KNIT step of SYTK--the "K."
A final note: In grabby yarn, the top (red) stitch may not be completely re-oriented by the slip maneuvers you have performed on it in steps 1 and 3d. This lack of orientation reveals itself in a proportionately shorter right arm, and a proportionately longer left arm, and disturbs the appearance of the left decrease column. Therefore, in a grabby yarn you may wish to add one further step. 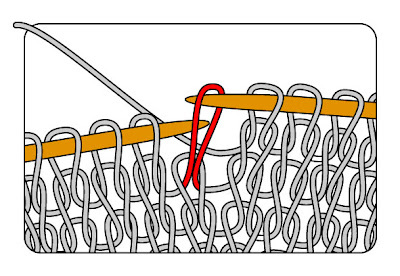 Per the illustration below, after the decrease has been finished, insert the tip of the left needle under the right arm of the already-knitted top (red) stitch. GENTLY adjust the red stitch to lengthen the right arm while simultaneously shortening the left arm, and you will see that the stitch orientation improves. Be MILD in your adjustment--you only want to redistribute yarn in from the left arm of the top stitch to the right arm of the same stitch. You don't want to tug so hard that you undo all your previous effort--you don't want to drag slack back from the second (green) stitch and dump it back into the top (red) stitch. Dear readers--have fun with this, and I hope you like it as well as I do! This is the second in a 4-part series about right and left leaning decreases. The most common RIGHT LEANING DECREASE (knit 2 together) was covered in the first post. Today's post is about the two most common LEFT LEANING DECREASES: slip 1, knit 1, pass the slipped stitch over (psso) and slip, slip, knit (ssk). Today's post is in two parts. The first part is a simple tutorial about how to make psso and ssk. The second part explains just what it IS about psso and ssk that makes them so sloppy looking (and so different looking from right leaning decreases). After today's post, the background stuff will be out of the way, and TECHknitting will turn to 2 new ways to make left leaning decreases. 3. (below) This is the final result, after the red stitch has been lifted over the blue stitch: only the blue stitch remains on the needle--one stitch where there were two before. The red stitch has been pulled to lie on top of the green stitch, and the slant of the red stitch (leftwards) dominates the decrease. 2. (below). For the second step of ssk, you slip the next stitch (green) from left to right needle the same way--KNITWISE, left arm forward. Then, you flick the standing yarn over your right needle, and knit the two stitches together from this position. 3. 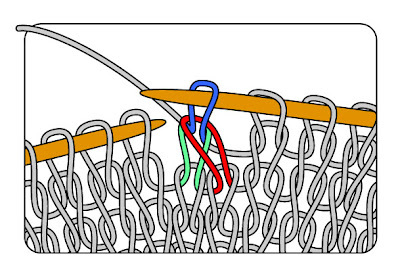 (below) Here is the final result: The blue stitch is pulled (knitted) through the red and green stitches. Just like psso, only the blue stitch remains on the needle, leaving one stitch where there were two before. The red stitch has been pulled to lie on top of the green stitch, and the slant of the red stitch (leftwards) dominates the decrease. OK, so now we're ready to talk about the two main reasons why left leaning decreases are all bumpy and slouchy. First, If you look at the diagrams for both psso AND ssk, you'll see that you are manipulating the FIRST STITCH on the needle--the red one. You're manhandling it pretty severely, actually. In both psso and ssk, you grab that red stitch and stretch it out as you slip it from left needle to right needle. This draws extra yarn into that first stitch as the surrounding stitches play "pass-along." In other words, by sliding the first stitch from one needle to another, yarn that would ordinarily lie in surrounding stitches gets pulled up into the loop of the red stitch. 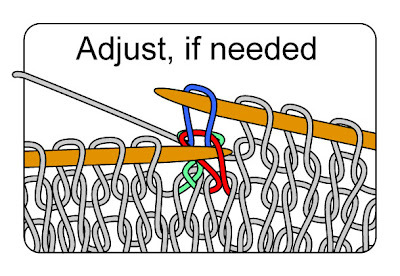 Second, you're changing the orientation of the red stitch--when it was first knitted (assuming you're not a combination knitter) it lay RIGHT arm forward. Slipping that first red stitch KNITWISE makes it lay LEFT arm forward. At the point where the orientation changes from right-arm-forward stitches to left-arm-forward stitches, for various esoteric reasons, slack develops in the yarn. (If you have an interest in yarn orientation, a lot more detail will eventually be posted when TECHknitting addresses "combination knitting.") For right now, suffice it to say that the change in orientation draws even more yarn into the first (red) stitch, in both psso and ssk. Compare this sequence with k2tog. 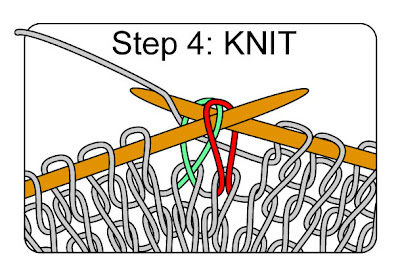 In k2tog, the top stitch is the SECOND stitch (green stitch), and it is never manhandled at all--it is never pulled up loose, never passed from needle to needle, and its orientation is never changed. (Click here for diagram, click here from more info on k2tog.) The stitch behind the top stitch (the red stitch in the k2tog diagram) never has a chance to pass any slack yarn along to the green stitch--that red stitch is nailed down behind the green stitch in a 1 step motion--it (and all its excess yarn) gets squeezed behind the green stitch before it ever gets a chance to play pass-along with the green stitch, and the one-step motion of k2tog reduces the opportunity for other stitches to pass along too much yarn, either. The upshot is that, in left leaning decreases, the multi-step procedure means that the first (red) stitch is drawn up all big and sloppy. Then, even more yarn is delivered to the red stitch by the change in orientation. As you can see from the diagrams, psso is the worse offender--you manhandle that red stitch not just once (passing it from left needle to right) but twice (as you grab it and draw it up big in passing it over the blue stitch). The upper part of each photo is the right leaning decrease--knit two together (k2tog)--which is included for comparison purposes--nice and even, aren't they? The lower part of the first photo (above) is slip 1, knit 1, pass the slipped stitch over (psso), the lower part of the second picture (below) is slip, slip, knit (ssk). Nice and sloppy, huh? 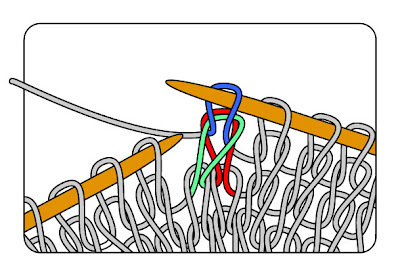 Welcome back to TECHknitting. I hope you all had a lovely summer, and that everything you wished for yourselves and your loved ones came true during these past few months. For me, the end of summer means my knitting batteries are recharged and it's back to illustrating knitting tricks for a second season. I hope you'll read along through this upcoming fall and winter, as more tricks desperate to escape my mind try to leap off the screen to infect yours. 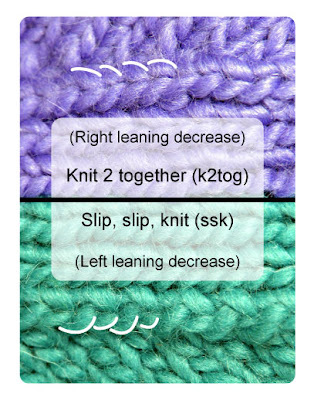 Traveling through the knitting sector of the blogosphere, I read lots of complaints about left leaning decreases, especially "slip, slip, knit," abbreviated "ssk." A lot of you are complaining that your (left leaning) ssk's are sloppy--you're complaining that they don't look like much like your neat and tidy knit 2 together's (k2tog, right leaning). (Click HERE for sketch illustrations of both.) So, I thought you might like a series on right and left leaning decreases, with a focus on improving the left leaning ones. Today's post, the first in the series of four, provides background material--it's all about the main right leaning decrease, k2tog. The second in the series will examine ssk as well as the left leaning decrease called "slip 1, knit 1, pass the slipped stitch over" (psso). The third and fourth posts will have illustrations and instructions for two new ways to make left-leaning decreases. "I used to think that people in the Olden Days were marvelously even knitters, because all really ancient sweaters are so smooth and regular. Now I realize that they probably knitted just as I do, rather erratically, and that it is Time, the Great Leveler, which has wrought the change--Time and many washings." I am quoting the greatest-knitter-of-us-all to absolve you if you aren't inclined to wrap your mind around all the complications I am going to dig into. If you can live with ssk (or psso, or any other method of left-leaning decrease you know) then you will find that these left-leaning decreases only improve with age. If you choose to, you will be justified in resolutely ignoring the lumpy left-leaning decreases on your needles, knowing that in the fullness of time, they WILL look better--and you can skip the rest of this post and read a different blog for today. Knitting, as you know, is connected in the rows AND in the columns. You can rip it out row-wise, or you can create runs by ripping it out column-wise. 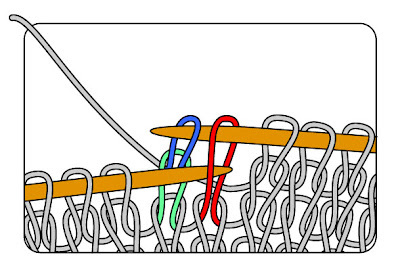 This means that anything you do to any knitted stitch in any given row not only has the potential to affect the stitches on either side of it in that row, but also has the potential to affect the column in which that stitch lies. In fact, it is the column effect of stacked decreases which is the most eye-catching --isolated single decreases can be done any old way, really, without making much of a difference to the finished fabric. Used in pairs, or in matching columns, right leaning decreases and left leaning decreases are meant to be twins. And, in a purely mechanical sense, they are. Each performs the same function in mirror image. 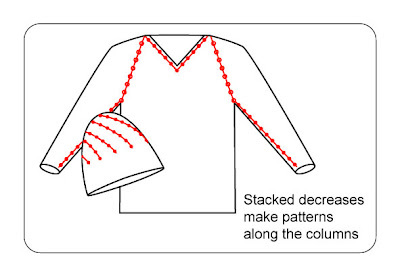 Either type of decrease removes one stitch from the knitted fabric, eliminating one column of stitches so there is now one column of stitches where two columns were before. In the illustration below, a right leaning decrease causes two bright green columns to become one dark green column, while a left leaning decrease causes two bright blue columns become one dark blue column. Just at the spot where the two columns are bridged to become one, the little scar of the actual decrease appears (outlined in red). This scar marks the two stitches bridging over the two old columns. The topmost stitch must slant either right (green) or left (blue) causing the resulting fabric to look as if the left column leaned over and ate the right column or vice versa. A continuous line of right leaning decreases are easy to make, and they look lovely and tidy as they slant off rightwards with no sloppy malformed stitches. Right leaning decreases are the good twin--the column of the decrease features regular, even stitches. The only difference between the right-leaning decrease column and the surrounding columns is its slant--the stitches of the decrease column and the stitches in the surrounding fabric look the same. In fact, in a right leaning decrease column, the stitches are generally so even that is difficult to tell which of the stitches is in the actual decrease row, and which in the "plain" row(s) in between the decrease rows. By contrast, the stitches of the column in which a left-leaning decrease appears look different than the surrounding stitches, and not just because of the slant. The stitches in a left-leaning decrease column are looser and sloppier--its easy to tell which is the decrease row and which the plain row(s) between decreases--the decrease row is the one sporting bumpy loose eye-catching yarn loops. In comparison to right leaning decreases, left leaning decreases are the evil twin. As stated above, the situation is actually worst just at the moment you are knitting the left-leaning decrease--it isn't actually all that much of a difference once the garment has been worn and washed a few times. But if this aspect of knitting is still driving you "knuts," then to solve this problem, we'll start by looking at the good twin, right leaning decreases. 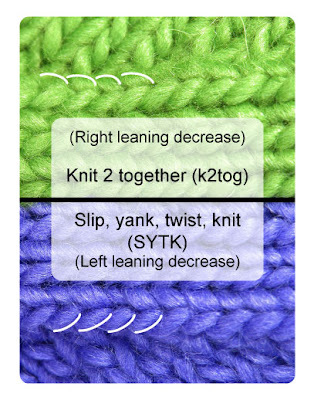 To make the right leaning decrease called knit 2 together (k2tog) you insert your right needle "knitwise" (from left to right) into the second stitch (green) on your left needle, and then thread it through the first stitch (red) on your left needle, also knitwise, as shown below. This leaves the two stitches on the tip of your left needle impaled on knitwise on your right needle, as shown below. 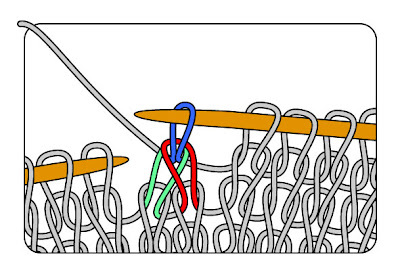 The standing yarn is brought into position to create the next stitch and the red and green stitch are knit together from this position, with the green stitch which caps the leftmost column on top. 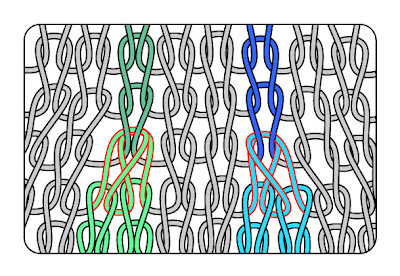 The green and red stitches are knitted together with the new stitch (blue). 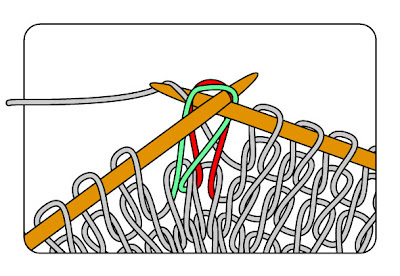 Because the green stitch from the left column is on top, it appears that the left column leaned over to the right and ate up the rightmost column, as shown below. Let's think about that sequence again. 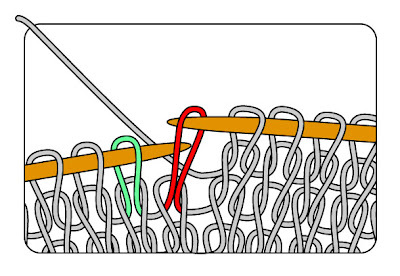 To make a right leaning decrease, the stitch (red) which lay on the very tip of the left needle was squeezed to the back of the fabric as the second stitch (green) overlaid it. In other words, when the two stitches were knitted together, that first red stitch was forced to the back for all time, as the second, dominant green stitch came to the front of the fabric. If you take the time to knit a quick k2tog right now, turn it to look at the back (reverse stockinette side) of the fabric. You will see a surprisingly large lump where the excess yarn from the first stitch (red) now lays on the back of the fabric. Closer examination shows that very much of the bulk of this second stitch has been squeezed to the back of the fabric. 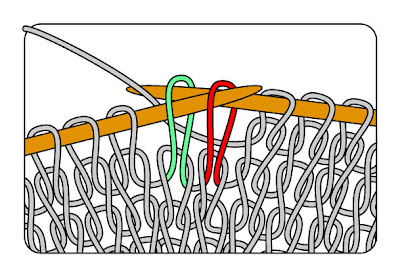 Turn your k2tog over again to expose the fabric face, and you will see that the right arm of the second stitch stitch (green) lays very near to the surface of the knitted fabric--that first red stitch has been so thoroughly squeezed backwards that very little of it comes between the right arm of the second (green) stitch and the fabric surface. The red stitch has been "disappeared." 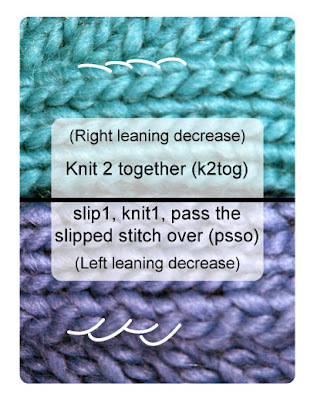 You have been reading TECHknitting on "right leaning decreases (k2tog)."